The above photo shows the Poultrybrook Farm which was located on land adjoining the Mundy Playing Fields. 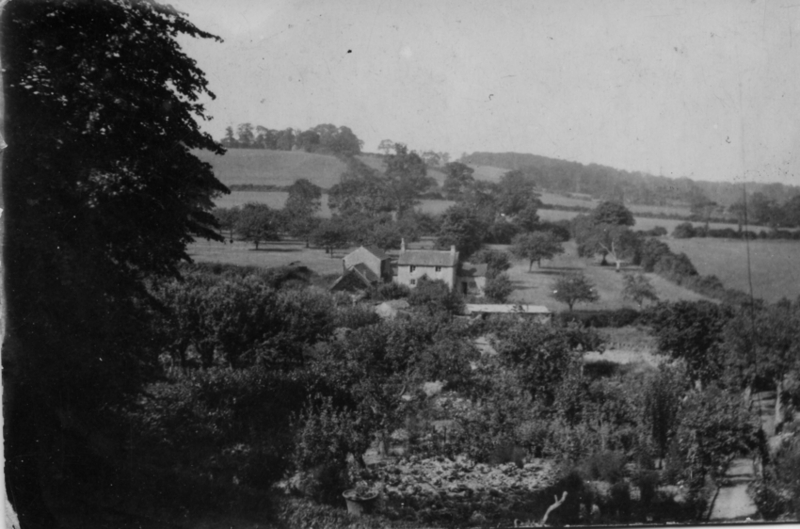 The photo was taken from the garden of Rosemount at 66 High Street. We are not sure when the buildings were demolished but we have records showing it was inhabited up until the early 1950s. The 1956 rating book shows the property was empty and a note was added to show that it had been condemned. The buildings were still being shown on the OS Map drawn up in the 1960s. We would like to hear from anyone who has any memories of the farm. In the 1990s the land had been used as a nursery for Christmas trees which were never been harvested. The land was acquired by Thornbury Town Council in 2005 to enable it to be used as an extension to the Mundy Playing Fields. Two pitches were to be provided on the land now known as ‘Poulterbrook’. The Council had to undertake a lot of work to clear the land and make it level and suitable for football and with the help of grants from the Town Council and the Premier League and the F.A. Facilities Fund work commenced in 2015 on the leveling, installation of drainage and seeding. The first matches were played there at the end of 2017. The name of ‘Poultrybrook Farm’ comes from the name given to the stream running through the land and on through the Mundy Playing Fields. Our earliest record of this stream in 1418 when historian William Caffall’s notes refer to the land, tenement, close or burgage of Henry Dagge and Johan his wife situated at the upper end of the High Street with the lower part “upon a water course called ‘Portreinebrook’. By the 1540s Thomas Dagge owned land there, amounting to five burgages. After Thomas’s death his son and heir John Dagge, husbandman of Winterbourne, sold this land called “Daggs” in September 1546 to Henry Lyddeatt of Thornbury. The land was “within the Borough of Thornbury situated between the burgage of Richard Hampden on the south and the cottage of Edward Hilpe, near the lane which leads to Porterybrooke, on the north”. In February 1563 Henry Lyddeatt sold a barn and the five burgages known as Daggs to Thomas Slimbridge of Thornbury, smith, for £30. The 1696 Tithe Terrier refers to ‘Poultry Brooke Lane’ and to another property called ‘Poultry Brooke Paddock’. We are not sure if this meant there was a farm or other buildings there at that time or earlier. We don’t know when Poultrybrook Farm was built. Although the references above mention the name of the stream they do not suggest that there was a house or farm which can be linked the property later known as ‘Poultrybrook Farm’. Our first definite record of the farm is the 1840 Tithe Survey and the accompanying map shows the lane as being ‘Poltibrook Lane’. The 1840 Tithe Survey shows the property was owned by Mrs Caroline Carrick and occupied by Robert Baylis. It was described as Plot 367, a house and orchard. It seems that at that time the farm was part of the nearby Marlwood Estate. For most of its known history, the farm was let out to tenants. Andrew Carrick was born in Kippen near Stirling in 1767, the son of Andrew Carrick and his wife Elizabeth (nee McEwen). He was baptised in Kippen on 9th July 1769. He went on to study medicine at Glasgow and Edinburgh graduating in 1787. He spent time in Hotel Dieu, the oldest hospital in Paris and in Rome before settling in Bristol. On 3rd November 1795 he married Elizabeth Hillier in Holt, Wiltshire. He had a very successful career in Bristol. He started at the Bristol Royal Infirmary in 1810 and became Senior Physician there in 1816. When he retired in 1834 he became an Honorary Physician at the BRI and President of the Bristol Meeting of the Provincial Medical and Surgical Association (which became the British Medical Association). He also became wealthy. In 1806 he purchased the Manor and Advowson of Nettleton, an estate of over 1000 acres. We are not sure if Andrew and Elizabeth ever lived there. He appears to have lived in Clifton area of Bristol and Poll Books of 1822, 1830 and 1833 list him as living in Clifton Hill. He is noted as actively promoting the therapeutic affects of the nearby Hotwell Springs and published a dissertation on the chemical and medical properties of Bristol Hotwell water. On 10th June 1817 Andrew’s wife, Elizabeth, died. They do not appear to have had any children. On 10th August 1819 Andrew married Caroline Tudway in St Cuthberts in Wells. Caroline was born in Wells on 16th March 1787, the daughter of Robert Tudway, J. P. of Wells and his wife, Mary, the daughter of Rev. Thomas Paine, canon of Wells. They continued to live at Clifton, presumably until he retired in 1834 when they appear to have moved to Marlwood. On 21st September 1821 Andrew bought Marlwood from John Cave. Poulterbrook is not listed in the schedule of the property he bought at that time so he must have added this later. Land tax records for Kington show that Andrew owned several properties there from 1824. In Thornbury records show that Andrew was a Guardian of the Workhouse in 1836 when the workhouse was located at the bottom of St Mary Street. He was involved with a dispute on the matter of a site for a new workhouse. He recommended it to be built on Coldstones, a piece of land behind the houses in the High Street on what is now part of the Mundy Playing Fields. Andrew was accused of self interest bearing in mind that he then owned Poultrybrook which would have adjoined Coldstones. In the event it was decided to build the new workhouse in Gloucester Road. Andrew died at Marlwood on 14th June 1837. He was aged 70. In 1838 Andrew’s trustees sold the Manor of Nettleton for over £11,000. The Marlwood Estate was put up for sale in 1840. We don’t think the sale of the estate included Poultrybrook Farm. The 1840 Tithe Survey shows Caroline continued to own Poultrybrook Farm, then let out to Robert Baylis. By the time of the 1841 census Caroline had moved from Marlwood and was living in Henbury near Blaise Castle. She died there aged 85 on 10th August 1872. The last will of James Willshen dated 1871 shows that “I give and devise my copyhold messuage orchard and premises situate at Poultry Brook in the parish and Manor of Thornbury which I some since purchased of Mrs Carrick and also my freehold cottages and gardens situate at Gillingstool in the said parish of Thornbury which I some since purchased of Anselm Harvey “ to Sophia Hughes his daughter for her life time. After the death of Sophia Hughes the messuage at Poultry Book was to go Gertrude Mary Powell Hughes her daughter and the cottages at Gillingstool to Catherine Sophia Hughes. We don’t know when Sophia sold the farm at Poultrybrook.